Beijing has long been seen as the world’s air pollution capital but the city’s air is not even the most toxic in China. 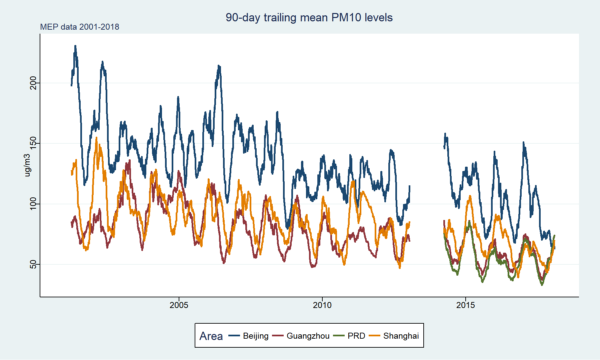 For the first time on record, levels of fine particulate matter in Beijing have dropped below the national average this winter. 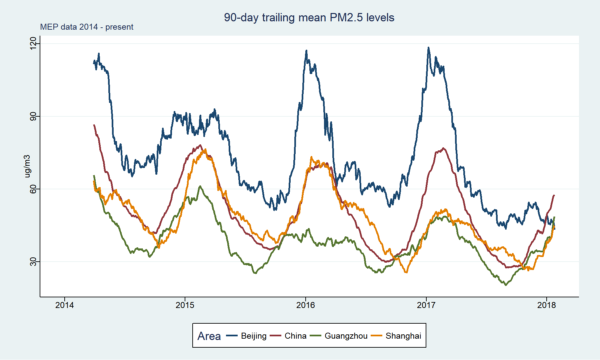 And economic hubs such as Shanghai and Guangzhou – a seat of trade and manufacturing near Hong Kong – are now recording levels of PM2.5 exceeding those in the capital. PM2.5 records show that prior to this winter, pollution levels in Beijing have been consistently higher than the national average since 2014. Before this point, PM10 was used as the indicator for particulate pollution. These records go back to to 2001 and suggest the same conclusion; however from late 2012 to early 2014, records were unavailable as the system changed over. Pollution levels in the Beijing region have dropped by record breaking amounts this winter, after the government implemented its air quality action plan. It introduced strict inspections of industrial plants and put operating restrictions on polluting industries, including the biggest shutdown of steel plants in history. Widespread bans on household coal burning were also introduced, contributing to air quality gains but leading to a wide scale heating crisis that reportedly left millions without heating for weeks. At the same time, national progress has slowed, with some major industrial regions not covered by the government’s plan recording rising pollution levels. The government’s winter action plan currently only covers the Beijing region in northern China. 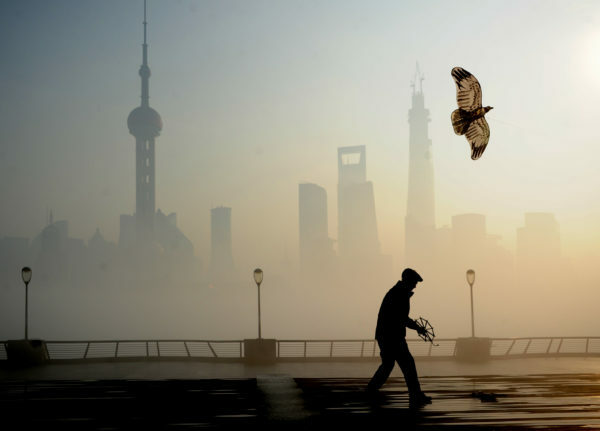 Shanghai and Guangzhou – both surrounded by manufacturing bases – have seen year-on-year increases in PM2.5 levels of 9% and 7% in the past three months respectively. As industrial output shifted away from the 28 cities surrounding Beijing, many areas in central and southern China have registered increases in emissions, driven by a credit stimulus that boosted steel, cement and coal sectors. China’s first national air pollution action plan, published in 2013, set air quality targets for 2017. These targets were met, including the ambitious target for Beijing, the most ambitious one. Even so the average PM2.5 pollution level in 2017 in Beijing was still 65% above the national standard – and six times above the World Health Organisation guidelines. A new action plan and new targets are expected this year, described by Chinese officials as “a three year battle plan in the war to protect blue skies”. More coal heating bans have been announced in Northern China, alongside stricter industrial emission standards for the Beijing region. Although the new plan promises to cover regions far beyond Beijing, industrial emissions standards in the rest of the country are yet to be amended. Addressing Beijing’s air quality issues is likely to remain central to China’s war on pollution. The key question for the country’s policy makers now is likely to be whether the aggressive policies in the capital will be replicated nationwide.